Kendriya Vidhyalaya ITBP Dehradun has released notification for the recruitment of teachers & Non-Teaching Staff for the academic session of 2019-2020. 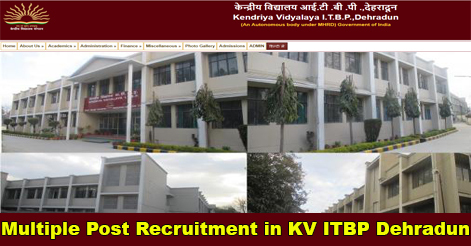 KV ITBP Dehradun has invites applications from eligible candidates for filling up various posts of Teachers, Yoga Instructor, Art & Craft Instructor, and Sports Trainer, Nurse, Doctor & Counsellor. This recruitment is purely on a contractual base. A Walk-In-Interview will conduct on 18 February 2019. TGT (Science & Sanskrit) 1. Bachelor Degree with 50% marks in the relevant subject from a recognized University. It is mandatory to have the relevant subject in all three years of graduation. 1. BCA/BE or B.Tech (Computer Science) / M.Tech (Computer Science) / MCA / M.Sc. (Computer Science), M.Sc or M.A. with PGDCA / M.Sc. or M.A with DOEACC ‘A’ Level. Instructor: Art & Crafts, Dance, Volleyball, Handball & Yoga Degree from a recognized University with Diploma in Relevant field from an accredited institution. Help us to improve this article/job posting "Teaching & Non-Teaching Staff Recruitment in KV ITBP, Dehradun". We would be glad if you can comment below and provide your valuable suggestions and feedback. If this page have any wrong information/list or out of context content, then you can report us as well. Music teacher ke liye post hai sir..?? I am in last semester of my b.ed can i come for Interview please rply i am from delhi and i have qualified my ctet jan 2019 exam. I m applying for Dance teacher. Is employment registration compulsory or can I come for walk in interview without it. Please clarify. Is vacancy for volleyball coach still available ?